The main difference between a detention basin or retention basin, is the presence or absence of a permanent pool of water, or pond. The water level is controlled by a low flow orifice. In most cases, the orifice is part of a metal or concrete structure called a riser. A detention, or dry, pond has an orifice level at the bottom of the basin and does not have a permanent pool of water. All the water runs out between storms and it usually remains dry. A retention basin or pond has a riser and orifice at a higher point and therefore retains a permanent pool of water. A retention pond looks like a regular pond, but plays an important role in controlling stormwater runoff. The basins are important for storing and slowing stormwater runoff from nearby areas, especially areas with asphalt or concrete development. Stormwater runoff flows much faster from these surfaces than naturally occurring areas and needs to be diverted to ensure the runoff occurs at the desired rate. The amount of cleaning and treatment of the water is limited. Dry basins, or detention basins, only control flood flows. A retention pond can also provide some water quality benefits by reducing pollutants and sediments. Dry detention ponds are best used in areas where there is ten or more acres of land. On smaller sites, it is difficult to control water quality and other options may be more appropriate. Dry detention ponds generally use a very small slope to divert water. The inlet needs to be not more than 15% higher than the outlet to ensure the correct amount of water flow through the system. The system works by allowing a large collection area, or basin, for the water. The water then slowly drains out through the outlet at the bottom of the structure. Sometimes concrete blocks and other structures act as a deterrent to slow the water flow and collect extra debris. Surrounding areas have vegetative buffer that can withstand dry or wet conditions. May cost less to implement than a wet retention pond because the size is generally smaller. Requires a large amount of space. Does not improve water quality. Can become a mosquito breeding ground. Can detract from property value, whereas retention ponds may add value. Wet retention ponds are a stormwater control structure that provides retention and treatment of contaminated stormwater runoff. 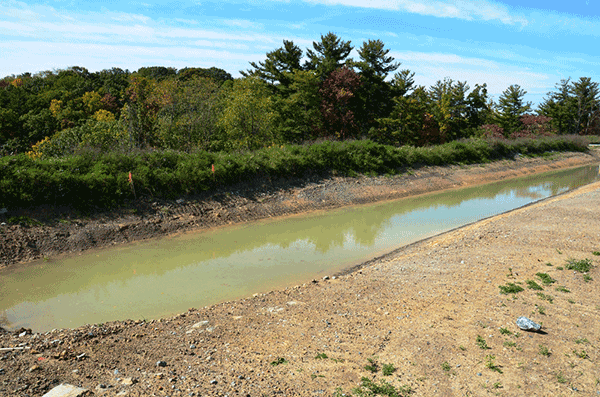 By capturing and retaining stormwater runoff, wet retention ponds control stormwater quantity and quality. The ponds natural processes then work to remove pollutants. Retention ponds should be surrounded by natural vegetation to improve bank stability and improve aesthetic benefits. Water is diverted to a wet retention pond by a network of underground pipes connecting storm drains to the pond. The system allows for large amounts of water to enter the pond, and the outlet lets out small amounts of water as needed to maintain the desired water level. From a health standpoint, there is always a concern with standing water. This can be a drowning hazard, particularly with children. Ponds can also draw mosquitoes, which may contribute to the transmission of some diseases. Retention ponds are simple if space is provided. Collects and improves water quality. Naturally processes water without additional equipment. Improved stormwater collection and flood control. Can be used for recreational purposes. Can be a drowning hazard. Large areas of land are needed. Negative water quality impacts if not properly designed. Identifying and repairing areas of erosion - A few times a year and after major storms, check for gullies and other disturbances on the bank. removing sediment and debris - Keeping pipes clear of debris and removing sediment ensures proper function. Remove debris around and in ponds before it reaches the outlets to prevent problems. Maintaining vegetation - The amount of maintenance depends on the type of vegetation surrounding the basin. Some grasses need weekly mowing, and others can be maintained a couple of times a year.